Like most parents-to-be, a good stroller was at the top of our list (well after “crib” anyway). Once our baby arrived, we soon realized something smaller, more lightweight and easy to transport really help us. An umbrella stroller was the answer. 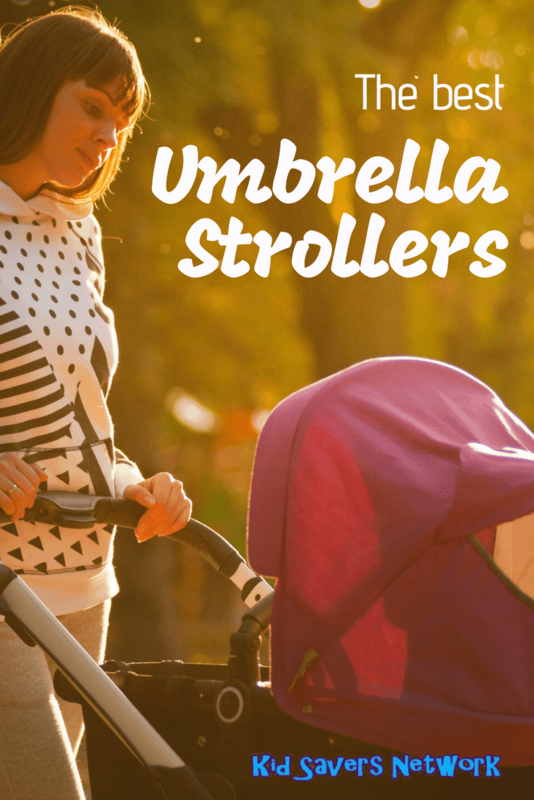 Our umbrella stroller is perfect for shorter trips outside and the times we’ve had to fly with our baby. When you have your hands full with luggage and a toddler on the loose, it’s a real plus. We love the fact it’s lightweight and quick and easy to fold up. You can also have a hand free and with a toddler that is a godsend! The other really great thing about them is they’re quite cheap, so you don’t feel bad for having two strollers! To be completely honest, we don’t use the more expensive one as much as these days. 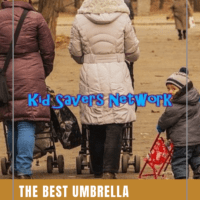 To help other parents in the same situation, we review the best umbrella strollers of 2018. 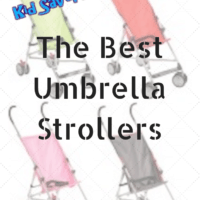 We have researched the market and tried to choose the best umbrella strollers for any budget and your baby. 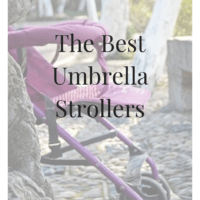 Whether you’re looking for a summer travel stroller, a stroller for toddlers, or the best umbrella stroller for tall parents, you’ll be sure to find it below. A stroller’s height is a very important feature many people overlook. You don’t want one which is uncomfortable to actually use. It’s no fun pushing your child around when your back screams “Stop!”. If you or your partner are taller than 5″8, most umbrella strollers will have you hunched over like Quasimodo pushing your little angel. Many tall couples have reported that the Zoe XL1 is the perfect height. It’s also got a lot of great features, too. First off it’s light but still sturdy. It weighs less than 10lbs and collapses easily with just one hand. When collapsed, it’s about the size of a piece of carry-on luggage. This makes it really easy to take on trips, and that’s the main reason people want these kinds of strollers in the first place. With its 5-point harness, Zoe has really taken care of the safety part. It brakes really well and Zoe have issued a “Lifetime Warranty” on the wheels. So they really stand behind their product (no pun intended!). Other great features on this model include the sun canopy, underneath storage and cup holders. Not essentials, but some really cool “Nice to haves” which will make your trips with little one more convenient and worry-free. The only real downside to this buggy is the price. However, as it’s so well made you can use the Zoe XL1 from around 6 months to 3 – 4 years old. So you can use it as a toddler stroller too. Something you can’t do with a lot of comparable models. If you’re after a tall umbrella stroller that’s exceptionally well-made, the Zoe X1 is hard to beat. 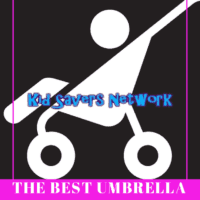 If you”re thinking maybe umbrellas stroller are too small, Summer Infant’s “Go Lite” is the one for you. It’s taller and more spacious than its competitors, but at just under 16lbs, it’s still pretty lightweight. Perfect for taking on your airplane adventures and long road trips. The first thing you’ll notice is it’s a bit taller than many umbrella strollers. A lot of these kinds of strollers are undersized, or maybe not actually designed for us North Americans?! The wheels on the “Go Lite” are smaller making it easier to push for a silky-smooth ride. It has a 5-point harness and quick-release wheel breaks for your little one’s safety. Another great feature on the “Go Lite” is that it reclines. It’s hard to find umbrella strollers that recline. There are some around, but they involve changing clips and harnesses. Hard to do quickly with a sleeping or fussing baby. The Go Lite reclines quickly by adjusting a strap behind the seat. You need to be aware it’s not a full 180-degree incline. However, it’s enough to get your little one off to sleep. It also means you can use this stroller from 3 months. Without a recline, you need to wait until your baby can sit up unassisted and has good neck control. So this is really a big plus. A drawback to the “Go Lite” is it doesn’t come with a cup holder. The canopy is also a bit on the small side. This means you can’t be out in the sun for too long. 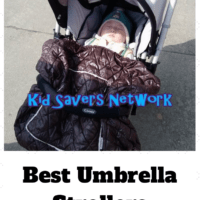 Overall, this is a great, mid-range umbrella stroller. It looks and feels like it costs double the price. If you’re after an umbrella stroller that reclines, the Chicco Liteway Plus is perfect. Unlike many similar models, this gorgeous looking stroller can recline fully flat. It has 4 different positions to help your baby feel comfortable and for you to get some well-earned rest! The Chicco Liteway Plus has a few more bells and whistles than the $20 varieties you can find at Wall-Mart. Firstly, there’s a 5-point harness to keep your little one safely secured. This is much better than the 3-point harnesses many cheaper ones have. It also has padded shoulder straps for comfort. 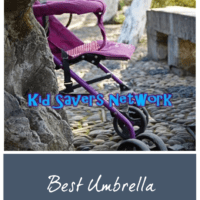 Again, is hard to find good umbrella strollers with shoulder straps, so that is another plus. There is a cup and storage basket under the chair and a detachable sun canopy. Some parents do find the canopy a bit on the small side, though. One thing that isn’t too small is the stroller itself. It’s a great height if you or your partner are a bit on the tall side. At around 20lbs, it is slightly heavier than others on our list. Still, his does have the advantage of making it seem a lot sturdier, too. It does fold down really easy and won’t take up a lot of valuable real-estate in your trunk. The Chicco Liteway Plus is a great “second stroller” for leaving in your car for unexpected trips or at the grandparents. Sometimes you can get a great deal on this model over at Amazon, so it’s worth checking their current price. 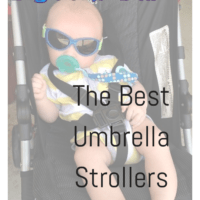 If you’re looking for a lightweight stroller for a specific trip, the Cosco umbrella stroller fits the bill. It’s cheap so you can buy a couple if you have more than one child. However, despite its low price, it also stacks up well against models costing double the amount. At just 7.2lbs it’s lightweight and sturdy enough to withstand baggage handler abuse! What I like most about the Cosco (apart from the price) is that it folds up super-slim. That means it can fit in many overhead compartments with ease. This is perfect if you’re taking a bus or train and are worried your baby sling or clunky stroller won’t do the job. One of the unexpected benefits of a more lightweight stroller is your baby will love to push them! They make a great push along toy, and my son loves pushing his around the park. The Cosco range comes in some really cute designs like “Sleep Monsters”, Mickey Mouse and bees. There are several downsides you need to be made aware of. There is only a 3-point harness. Frankly, his is to be expected at this price point. If you want a 5-point harness, you’ll need to pay around $20 – $30 more. Like many umbrella-type strollers, it also has a lower profile so taller parents will struggle here. Lastly, you need to use both hands to fold this stroller. If you need a low cost, travel stroller to take on vacation, this is a great choice.